Balsamic undertones of fresh cypress and heady frankincense balance the rich, woodsy scent of cedarwood, creamy sandalwood and sweet vanilla. Lightweight and ultra-conditioning, our premium beard oil deeply hydrates and strengthens your beard hair and the skin underneath. Each of our blends are crafted with five opulent oils – hemp seed, apricot kernel, grapeseed, castor, and sweet almond, that will help manage and tame your beard hair, promote healthy hair growth, calm irritated and inflamed skin, prevent in-growns, and eradicate ‘beardruff’ once and for all. Adding a quality beard oil to your daily routine will immediately make your beard look and feel better, and will also alleviate those frustrating early itchy stages. We’ve added a cocktail of carefully selected pure essential oils to spice up each blend creating its own masculine, signature scent. Appropriate for all skin types, including dry and sensitive skin. Suitable for light stubble to full beards. Each blend contains only premium 100% natural oils. Our oil blends are vegan, non-toxic, cruelty-free, and will never contain any synthetic fragrances, sulfates, parabens, or fillers. Suggested Usage: Shake gently before each use. Pour desired amount into palm and rub hands together for even distribution. Work the oil into the skin, then out to the ends of your beard. Use fingertips to coat the mustache hairs. Run comb or brush through beard to tame hair and evenly distribute oil. Apply beard oil after a hot shower when pores are open. Make sure beard hair is dry. Massage any remaining oil into the rest of your face for overall added hydration. Use once a day to keep beard soft and conditioned. The average beard requires five drops per application, meaning a 30 ml bottle should last approximately three months or +/- 100 uses. Precaution: For external use only. Avoid direct contact with eyes. Store in a cool, dry place and out of direct sunlight. Incredible product. Beard has never been healthier. Scent is present but not overpowering. 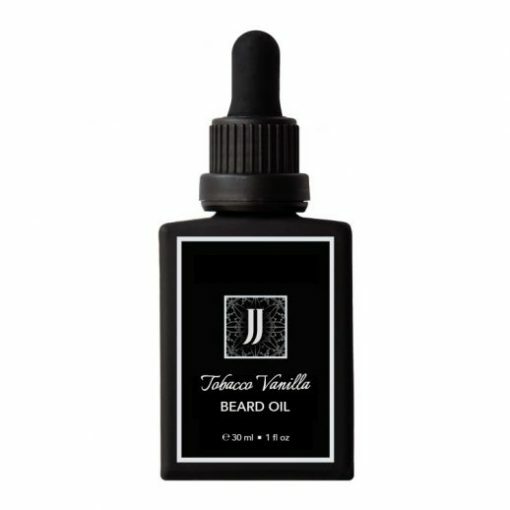 I’ve tried numerous oils but JJ has become the only one in my regime. Purchased this oil at Millarville Market this summer. Very happy with it. The scent(s) are very well balanced and get better as the day goes on. Amazing value! I use this beard oil everyday. I’ve tried numerous brands over the years with varying satisfaction. Some pretty good, others total flops. The quality of this oil is without comparison. Viscous enough that it absorbs in the beard yet rich enough that it’s not at all greasy on your skin. You simply can’t buy a better product. Absolutely LOVE this beard oil. Initially, the Tobacco scent is quite strong but over time it settles down and the Vanilla becomes more prominent. My beard now feels extremely smooth, hydrated, and has a nice consistency. Hands down the best beard oil I’ve ever invested in. Worth the $30!